KCD runs fine on modest hardware, but at max quality you're going to come up short. 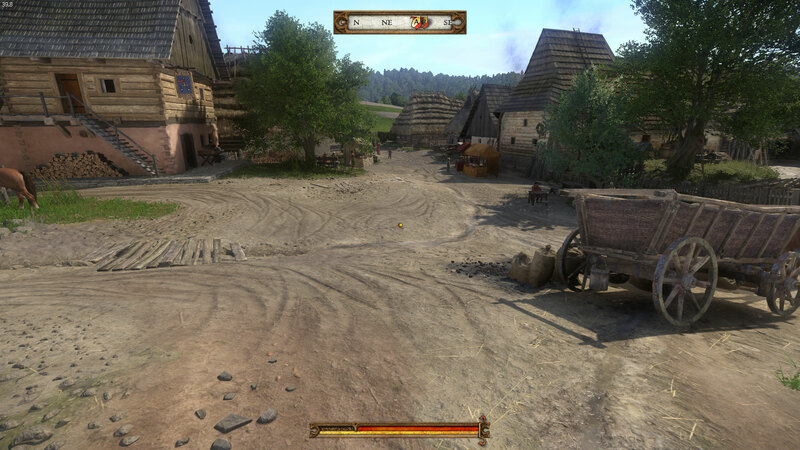 Kingdom Come: Deliverance is the PC's first big game of 2018, and deservedly so—as our review notes, it's a sprawling and intricate RPG. It's also quite demanding—but then, you'd expect that from just about any game built using CryEngine, right? Kingdom Come is certainly playable on a modest rig, and you can even get by with integrated graphics if you're willing to run at low quality and 720p. Crank things up to the ultra preset (which technically doesn't even max out a few options), however, and it will pummel any current PC. The minimum requirements list a GTX 660 or HD 7870 with an i5-2500K or Phenom II X4 940 processor—and you could still get reasonable performance at lower settings. The recommended hardware consists of an i7-3770 or FX-8350, with a GTX 1060 or RX 580. The problem is that there's no indication of what sort of performance you'll get from minimum spec or recommended spec hardware. But that's why I'm here. I'll run through all the settings in a moment, but if you're willing to run minimum quality, even a GTX 1050/RX 560 or similar hardware should manage over 60fps at 1080p. If you're gunning for 1080p medium quality at 60fps, the recommended systems should reach that level. What about ultra quality at 1080p? You basically need a Vega 56 or GTX 1070 or above, and even then framerates will often stutter—this appears to be inherent to the game engine at present, with towns being particularly bad. Here's the full rundown of the settings and features. As our partner for these detailed performance analyses, MSI provided the hardware we needed to test Kingdom Come: Deliverance on a bunch of different AMD and Nvidia GPUs—see below for the full details. Full details of our test equipment and methodology are detailed in our Performance Analysis 101 article. Thanks, MSI! In terms of desirable features, KCD pretty much crushes all the requirements. The only slight blemish is with aspect ratio support on ultrawide displays. The menus end up with black bars on the right and left, while the cutscenes appear to fill the full display, but they're actually cropping the top and bottom portions of the video content. It's a minor gripe, and overall kudos to developers Warhorse Studios. Note that some of the options will require accessing the console (via tilde ~) to open up the full set of features, but that's easily done. V-sync, FOV, and the HUD require console commands for example, which are listed above. The bigger deal for some is going to be full mod support. The game is too new to really get much in the way of mods yet, but Kingdom Come could become the canvas for a vibrant mod community. A few noteworthy mods that already exist include the ability to save as much as you want, and a tweak to lockpicking so it's easier, and more are sure to come. Obviously, 42 fps at 1440p isn't exactly an auspicious starting point, particularly for a high-end graphics card like the GTX 1070 Ti. But looking at image quality, the difference between the ultra and very high presets is negligible, and even high or medium (with a few tweaks) looks good. For that matter, even running at low quality isn't too bad. In terms of settings… well, there are a lot of settings to cover. Interestingly, about three quarters of the settings have almost no impact on performance, and relative to ultra quality, I found that turning twelve of them down (individually) actually reduced performance slightly. Basically, the ultra preset appears to have some optimizations that don't work if you start customizing things. The above gallery shows the various advanced settings at minimum, with everything else using the ultra preset. Click on the links in each image for fullsize comparisons. Note also that because I'm not running a complete benchmark sequence, and because of the particular location used for the testing, it's possible some of the settings that don't appear to do much can actually have a more substantial impact elsewhere in the game (eg, water detail near rivers and lakes). These estimates of performance impact are for now just that: estimates. Object quality: Controls culling of geometry for distant objects. Negligible impact on performance (at least on my test system, which is admittedly high-end). Game effects: Used to adjust the level of weather effects. Negligible impact on performance. Lighting: Sets the quality of global illumination. Negligible impact. Particles: Affects maximum number and quality of visible particles. Negligible impact. Physics: Sets the distance and precision of physics calculations. Negligible impact. Postprocess quality: Modifies the quality of high dynamic range, motion blur, and depth of field effects. Negligible impact. Shaders quality: Adjusts the complexity of shaders. This is one of the few settings that has a clear impact on performance. Lowering this can improve performance by up to 25 percent, though at the cost of some image quality. Shadows: Adjusts the softness and distance for shadow rendering. Not surprisingly, shadows also have a noticeable impact on performance, and turning this down can improve framerates by up to 15 percent. Textures: Controls the resolution of dynamic textures. Negligible impact (though maybe it would matter more on cards with less VRAM). Water details: Adjusts tessellation quality and shader complexity for water. Negligible impact. Volumetric effects detail: Controls quality of god rays (eg, from window lights). Negligible impact. Vegetation distance: Adjusts foliage draw distance. Negligible impact. Objects distance: Adjusts object draw distance. Negligible impact, though increasing this beyond the ultra default setting can reduce performance by 10 percent. LOD distance: Controls the distance at which higher quality textures are used. This is the only other setting that appears to have a substantial impact on performance, improving fps by up to 10 percent when set to minimum (and dropping it by 10 percent if you go beyond the ultra defaults). Vegetation draw distance: Adjusts the draw distance for vegetation (which is apparently different from foliage). Negligible impact. Motion Blur: The description of this setting in the game cheekily says, "Sets your side in forum flame wars!" Which is weird, because I don't know many people (if any) that like motion blur. But it's on by default, regardless of which preset you use, so I suggest turning it off if you don't like blur. This is you, recovering from brain overload at the plethora of settings. If you read through that list and feel overwhelmed, just know that most of the individual settings don't appear to do much. I tested this by starting at the ultra preset and then turning everything except for Shaders quality, Shadows, and LOD distance to high and then minimum. At high, performance only improved by 5 percent, while at minimum the net effect of lowering the combined 12 settings increased performance by just 12 percent. Yawn. But what's weird is that the presets have a far more substantial impact on performance, and when you start dropping everything down a notch, you get substantially larger changes. I'd recommend going with the presets for now, as custom settings seem to have unintended consequences, but your mileage may vary. For the benchmarks, I've used 1080p medium as the baseline (with the Ryzen 2400G APU and Intel's HD 630 also running at 720p low as a separate reference point). Ultra quality in this case is so demanding that I see little point in using it for benchmarks, so I dropped down one notch to the very high preset—which is still a beast to run. My main test system uses MSI's Z370 Gaming Pro Carbon AC with a Core i7-8700K as the primary processor, and 16GB of DDR4-3200 CL14 memory from G.Skill. I also tested performance with Ryzen processors on MSI's X370 Gaming Pro Carbon, also with DDR4-3200 CL14 RAM. The game is run from a Samsung 850 Pro 2TB SATA SSD for all of these tests. I'll add notebook testing in the coming days, and MSI provided its GS63VR with GTX 1060 6GB, GE63VR with GTX 1070, and GT73VR with GTX 1080. While I've only included a subset of the hardware for these initial benchmarks, the AMD and Nvidia graphics cards are relatively evenly matched—if we ignore the fact that AMD has nothing to compete with the GTX 1080 Ti. The RX 580 8GB result appears a bit of an anomaly, and I'm going to retest that in the coming days (watch the video and you'll see why I say this). The other cards all show quite a bit of variance in framerates. On the integrated graphics side, I've included AMD's new Ryzen 5 2400G APU along with Intel's HD Graphics 630. At 1080p medium, neither one provides a good experience, but drop to 720p low and the game becomes fairly tolerable on the Intel GPU, and quite playable on the AMD APU—though minimums remain choppy in testing. 1080p very high quality drops performance by about 30-40 percent, depending on your GPU, and ultra quality would drop that an additional 5-10 percent. Only the Vega and above can reach 60fps at these settings (still with stuttering at times), though the game doesn't require ultra-smooth framerates to play. Similar AMD and Nvidia parts (eg, GTX 1060 6GB and RX 580 8GB) deliver about the same level of performance, though, so at least KCD appears to be largely GPU manufacturer agnostic. 1440p very high maintains the same order for the GPUs, but now only the GTX 1080 Ti breaks 60fps—and you can just forget about maxing out a 144Hz 1440p display. If you've been hoping for a new game to punish hardware like the original Crysis, KCD at least makes a good effort at doing so. Mainstream cards like the GTX 1060 and RX 570 will struggle to maintain a steady 30fps, so dropping some settings to high or medium is recommended. 4k at modestly smooth 40fps is possible, and as noted already, KCD doesn't require insane framerates. Even so, this is pretty brutal, with only the nominally $700 (without cryptocurrency-induced GPU price inflation) GTX 1080 Ti really being viable unless you drop settings further. For these initial tests, I've used just two Intel and two AMD processors, with the GTX 1080 Ti. And what we find is that having a powerful GPU is only half of the battle, as your CPU can also curtail performance. Or at least, it can if you're running a top-shelf graphics card. At 1440p and 4k, things get a lot closer, but 1080p at very high can hit CPU bottlenecks even on less extreme graphics cards. KCD does scale with cores and clockspeeds, that much is clear. How far it can scale is a different matter, so I'm going to see about running a few additional tests—Core i9 and Threadripper, for example. AMD's Ryzen chips struggle a bit at 1080p medium, so we'll see if extreme core counts can make up for any other deficiencies. For the benchmark sequence, I've used the starting village, which isn't even the most demanding location in the game. If you're out in the wilderness, framerates can be higher, but in larger cities—or if it starts raining at night with flickering torches—don't be surprised if you get some stuttering and framerate spikes. Kingdom Come is also brand-new, so it's possible future patches and driver updates will smooth things out. If you watch the video, you can see the path I used for the test sequence—running from your dad at the forge down into town. I logged frametimes using OCAT, with CPU affinity set to the last CPU core in Windows Task Manager. 97 percentile minimums are calculated by finding the 97 percentile frametimes (the point where the frametime is worse than 97 percent of frames), then finding the average of all frames with a worse result. The real-time overlay graphs in the video are generated from the frametime data, using custom software that I've created. One of the difficulties with benchmarking Kingdom Come is that you can't save at arbitrary locations, which is why I started at the forge—the game created an autosave for me. Normally, I like to start in an area that's more demanding, such as the town proper, but this does give you a good view of how the game stutters as you enter a town. Thanks again to MSI for providing the hardware. These test results were collected February 13, 2018, just shortly after the retail launch. All the updated testing was done with the latest Nvidia and AMD drivers at the time, Nvidia 390.77 and AMD 18.2.2. I may hold off a few weeks to fully complete the testing, to allow time for patches and driver updates before I put any more time into running benchmarks. Kingdom Come: Deliverance is extremely taxing for most PCs, and you'll need a potent rig to run it at higher framerates. But you can also drop to lower resolutions and quality settings without losing out on much of what makes the game enjoyable, and given time we should see some of the rough spots get smoothed over.